It figures that when my life is busier than normal (have I mentioned that my kids aren’t in school and are basically with me all day? ), there are more than the usual amount of things to share! I have essentially zero time to blog right now, but since this is one tether I have to the outside world (and, some would say, my sanity), there is no way I’m missing a week of posting. Well, I really don’t want to, at least. Everyone counts – yes, I mean you. Maybe you’ve heard of Charidy.com. You might remember the MillionsforOutreach crowdfunding event from last February. This amazing use of technology and the connectedness of the online world is a total game changer for fundraising. In just one day, I, you, and anyone who participated, helped raise over one million dollars for the nineteen participating organizations. Didn’t get a chance to participate? Well, worry not! There is another Giving Day right around the corner. On Tuesday, June 2nd, #MillionsforChesed will be aiming for a target of $3 million in funds collected for 25 organizations. 1) the possibly of greatly decreasing the time and effort organizations need to invest in fundraising, enabling them to focus on what they are good at, what their mission is. 2) through participation in this kind of crowdfunding, organizations also increase their visibility and can potentially gain more recognition or supporters. 3) the image of all of us, sitting behind our computer screens, alone in our homes, individual in our actions, but joining together to create an achdus, a unity that represents what we are great at – giving! Each individual donation may seem like it’s negligible, but when joined together, there is such potential to bring so much light into the world, to create a viral phenomenon that is more profound and impactful that the typical viral posts that are sometimes found online. This crowdfunding transcends the vortex of time wasting that can sometimes happen online and elevates and unites all of us in our giving. So let’s do that. Because that sounds great. You can find out more about MillionsforChesed here, and you can contact Tobey Finkelstein for questions, too. Mordechai (her husband, the yid): “I hope this means I don’t have to pay for therapy. Ilana gives us a peek into her experience of growing up traditional, finding her husband, then finding out that he wants to be Orthodox, and all the complexities that followed that revelation. She is very candid and humorous as she delves into her preconceptions of Orthodoxy, of the difficulties she faced as they evolved in their observances, and of the meaning she has found in this way of life. Ilana doesn’t hesitate to raise questions she had or still has. There isn’t a glossing over of some of the more quirky parts of frum life. She is very honest, and I find that refreshing. The book jumps around in time, reflecting on the past and then skipping into the present. She includes a smattering of poetry and even some cartoons. It’s an easy read, and arranged in a way that you can read a bit here and there (if you have a busy life, hypothetically speaking). The 4th annual Orthodox Jewish All-Stars video is open for submissions. If you know someone who is Orthodox and excels in their fields, nominate them! The parameters can be found here. Nominations are only open until May 31st, so no procrastinating! 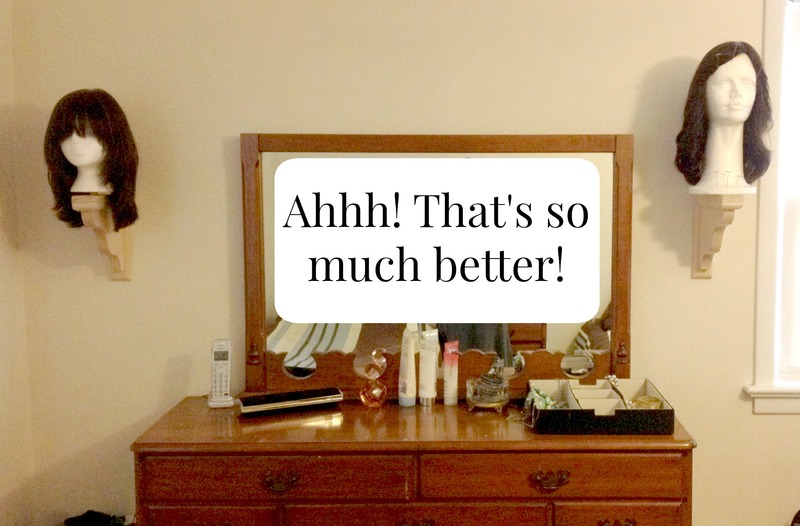 Need more space on your dresser top? 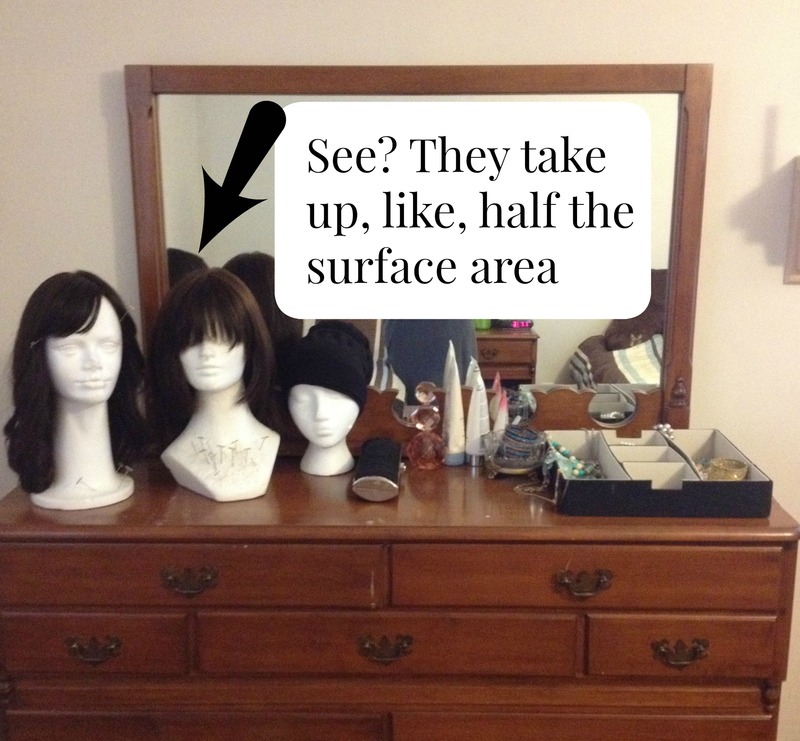 I keep my sheitels (wigs) on sheitel heads, which are head-shaped styrofoam heads. Yes, that did take some getting used to, having those sheitel heads looking at me as I try to fall asleep. When we were showing our house, I always wondered what people thought when they walked into my room only to find creepy styrofoam heads staring at them. Maybe that’s why our house didn’t sell so fast. A Facebook friend of mine posted this amazing find which I absolutely had to get. I’d been looking for something like this, and someone had even clued me into it on the blog’s Facebook page (though I couldn’t find the link, and I really tried! I’m sorry! ), so I jumped at this chance to have my own sheitel shelves! They were pretty easy to put up. The screws and pieces came with the shelves, and I was able to install them while my baby napped and my kids watched a video. They feel well-made and they look very nice. I’m going to stain them when my mom comes so she can teach me how to do that. They are made by a Baltimore man, but he does ship (full disclosure: I got the shipping waived for letting you know about the shelves. But I would’ve let you know anyways, because I love them). If you’re interested, contact him at (443)605-2415 or thesheitelshelf@gmail.com. You can purchase one for $45 or two for $80. Staining costs an additional $10. If you are in Baltimore and want help with installation, he’ll do that for $15. My post last week about how I feel about what’s on my head generated some interesting discussions, both here and on Facebook. Andrea Grinberg made this video which basically sums up how I feel about what you have on your head (spoiler alert: whatever you need to do your avodas Hashem is what I support. Need a sheitel? Do it! Need a tichel? Do it!). Seriously, watch that video. It put my mind at ease, especially since I had reservations about the whole tichel movement, ironically, when it first started getting bigger. I’ll probably write about that sometime, but not now, because it’s getting late and I’m getting tired. And for those of you who wonder why it’s okay to cover hair with other hair, this article really covers that nicely, I though (haha, no pun intended, oy). A Chance to Support some Artists! Both Rachel Kann and Rivka Nehorai are working on projects that you can help support. Because supporting the arts! Yes! Whew! That was a lot. I hope to have some more of my own work up next month, when I actually have time to do work. But one of the things I love about having a blog is connecting with people, and then connecting those people with more people. So, go on, connect! Previous Post Sheitel or Tichel – Is There Even A Question? Next Post How Does Judaism Affect My Marriage? New Orthodox Women Talk! Thank you SO much for the shout out!! I really enjoyed reading this post…I love your writing so much, it feels like we’re just sitting having a cup of tea and chatting. You’re so gifted. It is always a pleasure to see work that I want to shout out, by artists I love so much. And THANK YOU for the sweet compliment on my writing. Yes! I love the idea of all of us sitting and having tea and chatting. Many cool things seem to speed your way. Yashar koach for taking the time to share! B”H, it’s a really nice aspect of the interwebs. The shelves do look nice, but honestly, I think the wig heads look slightly more creepy that way. To me, they look like they now survey the whole room… What really makes me jealous is your dresser. Beautiful! Haha, yes, they do seem to be like hairy watch guards or something. I just found out that I’m supposed to put the heads backwards, though, so now they are facing the wall and I think it’s way less creepy now! Oooh, good stuff. Going to click on the why it’s okay to cover your hair with hair. I’ve read explanations before, but sometimes people ask me (I seem to be some sort of bridge to the Orthodox) and I know I’ve learned it before, but I forget the details. It is understandably confusing in terms of the spirit of the thing. Anyway, very impressed by your handiness by the way! Thanks! You should see my mother in action. She is astounding. When they moved into their condo a few years ago, she bequeathed me her power drill. I feel the mantle of handiness responsibility weighing heavily on my shoulders. hehehe. I always smile while reading your posts, but those ladies perched boldly on the shelves really had me laughing! My ladies (that’s what I call those heads…) sit proudly on an upper shelf in my walk in closet. Works for me. I hope the baltimore guy gets lots of business! Loved all your other plugs as well. Enjoy your time with the kids at home…. Good Shabbos! I love that you call them your ladies! That’s so classy! I hope the guy gets a lot of business, too. It’s such a nice idea.